Overall, Larsen is one of just 10 offensive linemen at the Football Bowl Subdivision (FBS) level to earn All-America honors from the USA Today as Cameron Erving (Florida State), Jake Matthews (Texas A&M), David Yankey (Stanford), Cyril Richardson (Baylor) and Travis Swanson (Arkansas) were named to the first-team, while Cyrus Kouandjio (Alabama), Taylor Lewan (Michigan), Xavier Su'a-Filo (UCLA) and Gabe Jackson (Mississippi State) joined Larsen on the second-team. 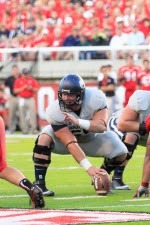 Larsen becomes just the 12th Utah State football player in school history to be named a first or second-team All-American, and just the third offensive lineman to be recognized this highly joining Dave Manning and Jim Hough who were both named second-team All-Americans by the Associated Press in 1973 and 1977, respectively. Larsen is also the only player from the state of Utah and the only player from the Mountain West Conference to earn first or second-team All-American honors from USA Today. Along with being named a second-team All-American by USA Today Sports, Larsen is also one of six finalists for the 2013 Rimington Trophy, which is presented annually to the most outstanding center in college football. Larsen was also named first-team all-Mountain West on Tuesday, becoming just the ninth player in school history to be a three-time first-team all-conference selection. Larsen, a 6-4, 312-pound senior offensive center from Salt Lake City, Utah (Jordan HS), has graded out above 86 percent in every game this year and above 90 percent six times, while recording 49 knockdowns.